Sometimes I use the phrase “asset allocation” at cocktail parties to sound smart. The host, whose party I am crashing, usually looks at me, surprised, and asks me one question: “How did you get in here?” Then I leave, usually. Anyway, asset allocation is a fancy way of describing where you put your money (e.g., 50% in stocks, 20% in index funds, etc). It’s like outlining a paper: You want to know where you’re going with your investments. Otherwise, you just get a hodgepodge of random investments with no central goal. I ripped off this nice piece of art from Microsoft Clipart to show you a nice way to think of your money: a pie chart. You have a certain amount of money (let’s just say $10,000 to make it easy) that you want to invest. Where do you put it? When do you need this money? If you need it in 2-3 years (e.g., for a car, a home, etc), you’re going to invest in a much more conservative investment than if you don’t need the money until retirement. This is because the market is volatile; over 1 or 2 years, your money could go up or down quite a bit. But from past trends, we can feel comfortable that the market will eventually go up over a long period of time. In other words, your risk is mitigated over a long period of time, but if you invest for the short-term, you will necessarily invest more conservatively. What’s your risk tolerance? Besides your time horizon, are you comfortable with risk? If you saw your investment drop 10% tomorrow, would you be ok with that? (I hate to give simplistic answers, but I’m just going to be honest here: The answer should be “I don’t care because I don’t need the money for 20+ years”).I hear people (especially young people) saying “I’m afraid of investing in stocks–look what happened during the dot-com bust.” That’s like saying you don’t like eating at a Chinese restaurant because you’re afraid they’ll secretly feed you dog. Generally, it’s not as if these people have carefully weighed out the risks and rewards of investing. It’s just that they’ve heard buzzwords like “the market is risky” and “my uncle lost all his money investing in Cisco.” Don’t be stupid, please.If you’re in your 20s, you should be very comfortable with investing in riskier investments like stocks (compared to, say, bonds). I’m not saying you should invest in risky stocks like startups. PLEASE READ THAT LAST SENTENCE!! Instead, I’m saying the investments you choose (after studying the investment carefully) should factor in that you’re young and risk-seeking. Yeah, I said it. You are actively seeking risk because, remember, risk equals higher potential for reward. I’ve written more about risk tolerance here: What’s your risk tolerance? What are your goals? Your investment choices depend not only on your timeline, but your goals. Once you’ve answered those basic questions, you’re ready to start thinking about allocating your assets. In general, young people keep their money in stocks, index funds, and cash. Don’t forget to keep some of your investment money in cash (in addition to some in savings); it’s a good idea to keep some in case you see a spectacular investment you want to make. Your savings, on the other hand, should be for short-term goals and emergencies. In general, the younger you are, the higher your percentage of stocks should be. As you get older, you’ll get naturally conservative, switching into protection mode instead of hypergrowth, and you’ll want to get more into index funds, bonds, etc. For now, if you have no idea where to start, you might start by buying an index fund. It’s ok that it’s 100% of your portfolio for a few months. (Remember, index funds are, by definition, diversified.) Then, as you get more comfortable with investing, start looking for more aggressive investments. You can also use the links below to create different scenarios for your finances based on different allocations. …“I don’t have $10,000!” Don’t worry. That was just an example number. If you have $1,000, you can basically replicate an allocation (just beware of trading fees, etc). You don’t want to invest $100 in a stock and pay a $25 trading fee, for example. Rebalancing to Restore Your Target Allocation – A good article on rebalancing your asset allocation, which is what you do periodically to make sure the allocation is staying at your target levels. For example, sometimes your stocks grow a lot, making them a disproportionately large part of your portfolio. What do you do? One rule of thumb that many experts use is to subtract your age from 100 to determine the percentage of investments to invest in stocks. If you’re 45, then you might put together a portfolio that’s 55 percent stocks and 45 percent bonds and cash. I love formulas like this because they are clearly for morons. If you really think that a one-size-fits-all suggestion is right for you, I am going to first scream at you and then try to sell you something fraudulent. Please, think for yourself. The article is pretty good, though. As usual, if you have any comments or questions, please let me know! I must disagree with you about it being better to put all of your money in stocks when you’re young. The problem with that is most (75%) of stocks move with the market, which means that you’re exposing yourself to much unneeded risk. The best reason to buy some bonds is that they tend to move in the opposite direction of stocks. That way, if you put about 20% in bonds, you reduce the variance of your investment by about half. In fact, you’ll get the same return with much lower risk if you put 90% of your money in stocks and the rest plus another 20% in bonds on margin. I agree that a well-diversified portfolio will get you the best returns over time. But stock indexes just crush bond-market returns (again, over a long period of time). So while bonds do protect your downside–and help you when the market goes down–that bond money could be used for something better right now. I’m really interested in what you said about investing 20% in bonds reduces the variances of investments by half. Is there a place to read more about that? to earn 4% in the bond fund. but overall the stocks will perform much better. my non-retirement emergency funds in that number. 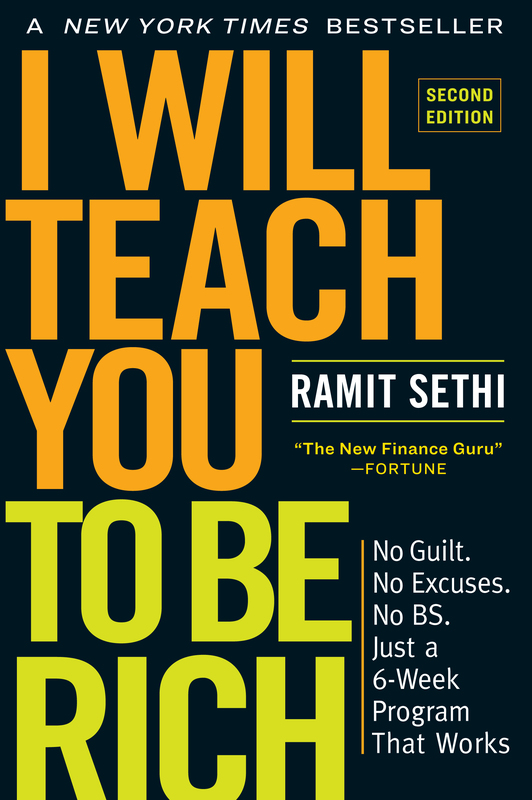 Ramit (or anyone) – how would you calculate the % that a real estate investment takes up in your portfolio if it wasn’t a straight up purchase, like a stock or bond (usually) is. So for example, let’s say I bought a condo somewhere and was renting it out. I made a downpayment of $10k and am now paying $1500 every month in mortgage, taxes and fees, and I’m bringing in $1600 in rent (totally made up #s, btw). Would you use the $10k figure to calculate the % that this RE investment takes up in your portfolio or some more complicated figure that takes the estimated value into account? I would recommend trying to sell someone something fraudulent BEFORE you scream at them, as they otherwise might be put-off by the screaming and less likely to buy.